Help the little bunny reach the goal! In this cute puzzle game, your task is to slide tiles and form a path with as few moves as possible. 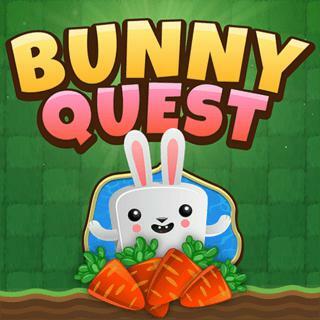 Make sure to collect all carrots on your way and complete 80 increasingly difficult levels! In case you are stuck, use one of the hints available. Can you earn all golden carrots and finish the game? Welcome to our famobilicious HTML 5 cross-device game catalog. Here you can find more than 300 non-exclusive and exclusive licensed HTML5 games, reviewed, categorized and hand-picked for every taste. Feel free to browse through our games created by developers from all around the world. If you like Bunny Quest games, you should check out the other games from our famobilicious game catalog. Do you need help? Why don't you check out our Help & Support category and see if your questions and problems can be solved.